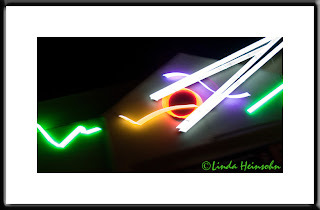 I've driven by this sign, at a restaurant named Chopsticks near Hollywood and Highland (Los Angeles), countless times and have always wanted to photograph it in some way. Turns out, my little project of doing motion shots while driving (my husband was driving, not me) was perfect for this neon! In my shooting haste, the photo turned out fairly crooked. From there, I accented the crookedness in Elements 4, rotating it another 6 degrees to the left. I like how the bright colors now splash diagonally across the screen.